Unique electronic duo Matmos, joined by So Percussion, trumpeter Dave Douglas and harpist Zeena Parkins, presented an extraordinary amalgam of sound on Saturday night. The “orchestra of sound” produced rhythmic music with standard instruments such as piano, drums, harp and timpani, but also created whole songs from such everyday objects like aluminum cans, metal sheets, foil, shells, pottery, water, and pieces of clay. The highlight of the evening was the excerpt from the electronic version of Verdi’s Aida, commissioned by the City of Verona Italy. As the floor-to-ceiling curtain was raised at the opening of the Aida piece, the Allen Room at Lincoln Center’s Rose Hall window revealed a breathtaking panorama of the Columbus Circle/Central Park/59th Street area. The convergence of the electronic music with the stunning cityscape was one of those perfect moments of live music when the setting perfectly compliments the performance. When I ordered the tickets online, I assumed that “Row A” would place me in the first row. I did not imagine that the first row would be a mere 5 feet from MC Schmidt. The experience of being within arm’s reach of the performer was truly a fortunate stroke of luck. However, such a position made the logisitics of recording this concert, despite express permission from Matmos, practically impossible. Instead of opening my equipment bag, I placed it under my seat and thoroughly enjoyed this tremendous experience. In appreciation of readers who expected a recording of this concert, I have reached into my recent archives and have posted above a Zeena Parkins concert I recorded in 2006. Morrissey became ill during his Boston concert earlier this week. Northhampton and Philadelphia concerts were postponed that evening, with the expectation that Moz would return to the stage for New York City. A short time ago, it was announced that Madison Square Garden has now also been postponed. Here is the Pollstar Report. Got an extra ticket, I’ll tape the show for you! Thanks for all the suggestions in email. I will be attending and recording the Fiery Furnaces concert at Maxwell’s in Hoboken. Well, the concert was not rained out, but my taping was. At about 7:30 pm, about a half hour before they were to play, it was raining pretty steadily, and there was no place to set up my equipment under any cover. Unfortunately, I can not risk water damage to my recording rig, and I was forced to lug it all home. The Seaport was absolutely jammed with people, and with the rain, the humidity, and the unworkable crowd, I can’t imagine that it was a particularly enjoyable experience. I’m sorry to have missed AC, and of course missed recording them, but the outside concerts are always risky ventures. I am going to try to add a new recording date on Sunday, and will update the site on upcoming outings. 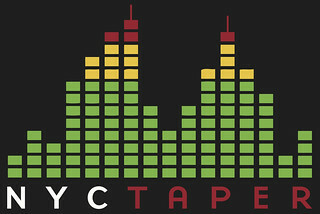 nyctaper is the weblog and archival location for a New York live recordist. This blog is the first of its kind on the web. An actual live recording engineer will discuss the live concerts he records, and offer free downloads of those recordings in “lossless” CD-quality formats. This is not a concert fan’s diary, this is a not a blogger downloading music from other sites and uploading mp3s. This is the real deal. nyctaper records the concerts, and posts the high quality recordings himself. As this site develops over the next few weeks, all software tools will be linked, instructions for download, listening, archival and cd burning will be provided, and most importantly concert recordings will be posted within days and sometimes hours of the end of the show. Check back for coming attractions.